Sinking concrete is actually very common. Sinking concrete is actually very common. We’ve all walked on a cracked or uneven sidewalk at some point. When the soil underneath of the concrete slabs is no longer able to hold their weight, they start to sink. This causes the cracking and uneven-ness that we see. Here are some of the most common causes of concrete sinking. 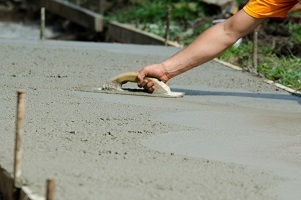 When concrete is poured for driveways, sidewalks, patios, and other projects, there is often soil that is spread out to achieve the desired grade. After spreading out the soil, it should be compacted down until it is hard and strong. If concrete is poured directly on top of the un-compacted soil, it can cause the concrete to settle and crack because it isn’t being properly supported. Another thing that can cause concrete sinking is when the soil underneath washes away. Erosion, plumbing leaks, heavy rains, and other things can cause the soil to wash away from your concrete. If enough water seeps up under the concrete, it can cause the soil to move and wash away. The more soil that washes away, the more the concrete will sink because there just isn’t enough there to support it. Simple changes in the amount of moisture in the soil can also cause the concrete to sink. If there is clay underneath and it gets wet, it will expand. On the other hand, if the soil gets exceptionally dry due to drought or extreme heat, it will shrink. When this happens, there’s nothing underneath the concrete to hold it up, so it just settles and cracks. This entry was posted on Friday, February 9th, 2018	at 9:10 am	and is filed under Concrete	. You can follow any responses to this entry through the RSS 2.0	feed. Both comments and pings are currently closed.